January 23rd, 2019 Who Manages Ethereum Mining? Are They A Good Target For Litigation Or Regulation? This post addresses one aspect of who runs Ethereum: mining pools. "Mining" is the process by which new blocks are appended on the Ethereum blockchain. In one sense, miners control the Ethereum blockchain because they add blocks. But who are the miners, what do they control, and who controls the mining pools? A handful of identifiable individuals run the mining pools that organize 2/3 of Ethereum mining. Mining pool operators do not share very much about their operations. Mining pools have very limited control over mining, despite appearing to control it. The chart at the top of this post shows the sources of Ethereum blocks over the last 7 days according to Etherscan.io. I've removed the labels for sources that were responsible for less than 2% of the blocks to make it clear who the large players are as of mid-January, 2019. 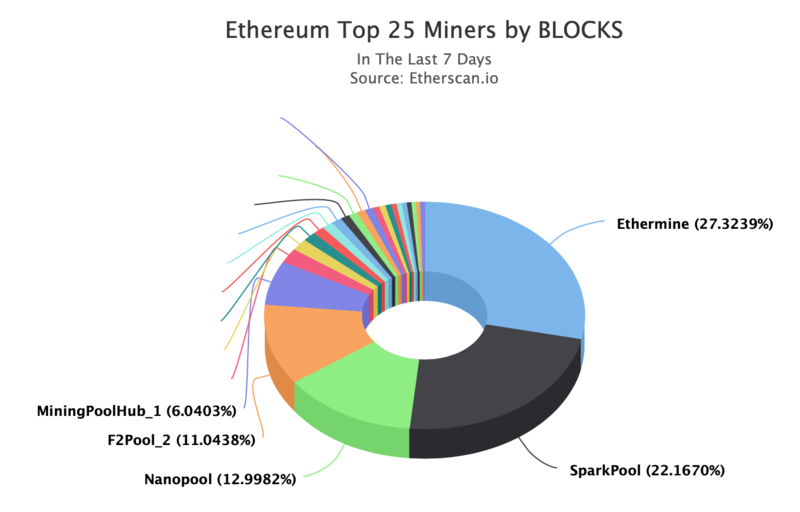 The chart shows that "Ethermine", "SparkPool", and "Nanopool" are the source of nearly 2/3 of the blocks over the last 7 days. Who are they? What do they do? Where are they based? A "pool" is crypto jargon for a software system that enables users to pool their computing power and then pay out the mining rewards to the pool members in accordance with the processing that they've contributed. The purpose of a pool is to smooth out the returns from mining because the chance that any particular miner will discover a block is quite low. Since some miners have significant investments in mining equipment they would prefer to receive a steady stream of returns rather than a low chance of a high reward. In exchange, the pool operator receives approximately 1% of the mining rewards. As expected of a multi-billion dollar business, there are many details about mining pools that are best left to further reading elsewhere. It's important to note that the pool operators aren't (or aren't necessarily) the people doing the mining. The major mining pools are open systems that allow anyone who does Ethereum mining to connect and participate. In some cases, it's possible to switch between them and it's a globally competitive business. A miner selecting which mining pool to join will be evaluating the price, convenience, need (or not) for proprietary software, market share (since they want a fairly consistent stream of returns), track record, etc. Based on how little information is made readily available (see the research below), it seems that corporate structure and jurisdiction are not very important factors for customers. Ethermine is a pool run by Bitfly Gmbh, an Austrian corporation. Bitfly also runs a popular Ethereum block explorer: Etherchain. The founder and CEO of Bitfly is Peter Pratscher. According to the imprint for ethermine.org, Peter Pratscher is the 100% owner of Bitfly Gmbh. Before founding Bitfly he was an engineer/technical expert working in the cement industry. Peter's success with Ethermine is a great example of founders from outside the tech industry coming into the crypto world in recent years. Bitfly also runs a pool called Ethpool that has a different model from their larger Ethermine pool. The multi-product strategy persued by Bitfly is common in the industry and makes a lot of sense from a business point-of-view but I'm surprised to see that they haven't hived off the separate product lines into distinct corporations in order to help insulate the group against claims. SparkPool is a mining pool based in China. It's owned by 杭州远境互联科技有限公司 ("Hangzhou Yuanjing Internet Technology Co., Ltd."). According to the corporate register for mainland China, the National Enterprise Credit Information Publicity System, the company was established in March 20th, 2018. The CEO of the company that runs SparkPool is Xin Xu. Xin Xu is a bit hard to identify as the CEO (for someone who speaks English) but it can be seen on SparkPool's Twitter that they've liked his posts and there's other evidence that supports him as the CEO. SparkPool seems to have come up about as a result of his role at Ethfans, an Ethereum community site for a Chinese audience. Nanopool is owned by a Hong Kong corporation, "Nanopool Limited", that is in turn owned by a Swiss corporation, "Finom AG". The Hong Kong Integrated Companies Registry Information System lists the date of incorporation as October 12th, 2017. The ownership structure for Nanopool Limited is explained in a white paper by the parent company. The founder of Nanopool appears to be Alexander Barkovsky based on a blog post he appears to have written in 2018. It is very hard to find information about Alexander and it's unclear where Nanopool's operations are located. The office listed for Nanopool doesn't appear to be their operational office as there are several companies registered with that address (not unusual in the world of crypto). Nanopool, like Ethermine, sits within a wider corporate setting (Finom) and is a part of a portfolio of blockchain-related businesses (also not unusual in the crypto world). What Can Mining Pools Do? Mining Pools are mostly a tool for miners, rather than a service for controlling mining. Mining pools generally don't make the software or hardware used for mining and this significantly limits the amount of control they can exercise. SparkPool doesn't recommend any particular mining software and notes (in Chinese) that it's irrelevant for using their Ethereum pool. Nanopool has its own proprietary mining software and license terms. Ethermine supports a variety of mining clients. Since the mining pools (mostly) don't control the software that miners use, they have little ability to affect the contents of blocks or otherwise exert actual control over the Ethereum blockchain. Lawyers often think in terms of who's accountable, who pays, and who gets to make the rules. Mining pools have identifiable companies and people behind them, so they would appear to be a good target for litigators/regulators looking for someone to hold accountable. But in reality, mining pool operators have such limited impact on the ecosystem and very little say over which transactions are included in blocks. In one sense a mining pool might be considered responsible for any given block but would generally not know (or care) what's in the block, wouldn't know which parties are transacting in a block, and wouldn't have much of a chance to affect the block because they don't set those rules (the mining software makers set that, explained below). Mining pools are in a fundamentally different position from smart contract authors (who have been pursued by legal processes, including the SEC, America's federal securities regulator). Their degree of control, lack of knowledge, and position within the ecosystem makes them one of the least likely potential targets for someone interested in the Ethereum network, or a specific part of it (e.g. a smart contract system like EtherDelta). Furthermore, from a North American point of view, the major mining pool operators are located in Europe/China which would make enforcement especially costly. There are interesting jurisdictional questions that depend on the circumstances of the action such as where do their activities take place? Is the answer where the blocks are relayed? Where the mining pool operator is domiciled? Lots of possibilities depending on the facts, but all of them likely hypothetical because I would be surprised to see an action against a mining pool initiated by anyone other than a miner who used their service and didn't get the payout they deserved (i.e. their customers). If mining pools themselves aren't a good target, what about the makers of the software that miners use to connect to the pools? What About The Makers Of Mining Software? Based on the above, mining software developers might seem like a better target because they get to choose the rules for mining (within the bounds of the Ethereum protocol) but it would be very difficult to hold them to account for the actions taken (or not taken) by miners. The mining software developers (e.g. ethminer) make tools for mining any block, without regard to the legality of the contents of those blocks. I think it's extremely unlikely that any kind of case could be maintained against them (they're too far removed) and regulation of them would be futile because they would simply migrate to friendlier jurisdictions and distribute their tools from there. The story of BitTorrent clients is an excellent case study in why this wouldn't be a realistic avenue for controlling Ethereum or what's done using the Ethereum network. But it might be possible for miners who lose money as a result of mining software failure to pursue the developers. Mining pools have a role to play in the Ethereum ecosystem but they're not a particularly good "target" from a legal point-of-view. They are an interesting example of centralization in a decentralized environment because there are a small number of actual humans who have some degree of control over mining but they're essentially conduits for large numbers of miners to act. The mining pools are platforms for miners to cooperate. They are a few steps removed from decision-making authority over what goes into the Ethereum blockchain (or at least, in the typical model for a mining pool). The mining software developers, who make the tools used to connect to mining pools, are also very far removed from any actual harm resulting from Ethereum transactions. So if mining pools aren't a good target for regulation or litigation in the Ethereum ecosystem, who is? Future blog posts will explore other actors and their potential legal issues. There are better places to look for legal liability.